Prince wooed us with his 1984 classic hit “Purple Rain.” Chanel Beauty, M.A.C Cosmetics and Manic Panic want to remind us just how wonderful it is to bathe in purple rain. CHANEL (Rouge Allure Lip Color: Hysteria): Glam Goth for our inner vixen. Wear this intense blackened-purple full-on or dab with your finger and blot for a berry bitten stain. M.A.C COSMETICS (Eyeshadow Quad: Interior Life): Daphne Guinness with her fashion-forward existence, it’s no wonder the fashion world can’t get enough of her. Her collaboration with M.A.C Cosmetics is very sultry, with colors like muted pink, dusky lavender, charcoal and mid-tone grey, for a rich, smoky-eye look. 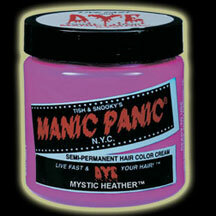 MANIC PANIC (Metallic Lipstick: Hells Bells): Allow me to introduce a shocking yet versatile pigmented lip hue. A dark metallic grey that works great with a neutral face and clothing brands like Helmut Lang, Gareth Pugh, Alexander McQueen, Alexander Wang, Herve Leger, Calvin Klein, Custo Barcelona and Theykens’ Theory to name a few. 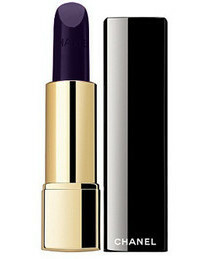 Feel free to mix this color with Chanel’s Hysteria for a deep purple-grey effect. 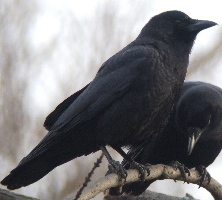 MANIC PANIC (Lipstick: Raven): The Raven bird is revered as an authoritarian symbol of mythology and folklore, equally powerful is Manic Panic’s Raven, known to many as the #1 black lipstick in the market. Not just for Halloween or Gothic girls, this color has transitioned to greater heights. Incorporate subtle touches of M.A.C Interior Life Eyeshadow Quad for a truly bewitching look. Makeup artist Jordan Liberty from Give Good Face demonstrates a how-to tutorial for Runway Gothic lips using a black liner and purple lipstick.